This November, Americans will go to the polls to decide the first President of the United States in the new millenium. I only hope that the race for the presidency is half as interesting as the competition in the MP3 Springboard module market recently. 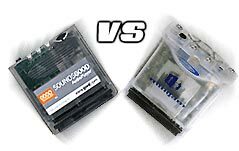 Let's find out what the differences are between the InnoGear MiniJam and the Good Technology SoundsGood. Please see the reviews of these products for more in-depth coverage. Size 2½ x 2¼ x 1-1/8 2.13" x 2.22" x .35"
Weight 1.4 oz. 0.8 oz. * In testing. Your transfer speed may vary slightly.